Terms and Conditions Closing Date: December 20 beginning at 7 PM Pick up Date: December 22 from 10 AM until 12 NOON ALL ITEMS ARE SOLD IN 'AS IN WHERE IN CONDITION. 1. Buyer's Premium A buyers' premium of ten percent (10%) of the high bid will be added to the high bid to determine the final selling price for the auction lot. 2.Disclaimer Walker Auctions has attempted to provide accurate descriptions of all items, however, it is the bidder's responsibility to determine the condition and suitability of each lot. Printed statements or descriptions by Walker Auctions staff are provided in good faith and are matters of opinion. All lots sell as is, with all faults. Walker Auctions and the seller do not give or make any type of guarantee or warranty regarding the lots to be sold, implied or otherwise. All sales are final. There are no returns, refunds, or adjustments. 3. Auction Ending If a bid is placed in the last ten (10) minutes remaining for an auction lot, bidding for that lot will remain open for an additional ten (10) minutes. Bidding will continue until a ten (10) minute period passes with no additional bids. 4.Sales Tax No sales tax will be charged for this auction. 5.Payment All buyers must pay for their purchases in full at the conclusion of the auction. 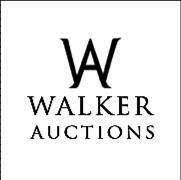 Walker Auctions accepts only MasterCard, Discover, Visa and American Express. Walker Auctions reserves the right to resell any property not paid for in full by the conclusion of the stated pickup period. In any such event,the Buyer will still be responsible for payment for the original purchase and the costs of collection of this payment andor damages resulting from the resale of the property. 6. Local Pickup (if this applies to this auction) Walker Auctions will provide a local pickup location and schedule for those in Memphis metropolitan area. Winning bidders will be notified once we have received and acknowledged payment in full. Buyers are responsible for rigging, loading,and moving all items purchased without assistance from Walker Auctions If you fail to pick up your items, they are forfeit, without refund to Walker Auctions. 7. Shipping Unless noted in the description, any item can be shipped. Buyer pays all shipping cost. Pack Mail will contact you and will work out shipping address, billing and shipping date directly with you. 8. Debt Collection and Interest Charges the buyer agrees to pay all reasonable attorney fees and other costs incurred by Walker Auctions in its efforts to collect unpaid funds from the buyer. The buyer agrees that a fee of 2% of the outstanding balance per month be added to any unpaid balance due Walker Auctions. Any debt collection or dispute proceedings will be heard in Shelby County, Tennessee. 9. Age Requirement All bidders must be 18 years of age or older. 10. Bidder Information and Security All registration information the bidder provides to Walker Auctions shall be current, complete, and accurate. All bidders are responsible for any bids placed under their bidding numbers and passwords. The security of bidder information is the responsibility of the bidder. Bidders must notify Walker Auctions if they believe that their bidder number and password have been compromised. 11.Technical Problems Bidder agrees to hold Walker Auctions harmless for any power outages, insufficient internet connections, or technical issues that may arise. 12. Unexpected Early Closing If the online auction closes prematurely Walker Auctions has the opportunity to activate the auction and allow it to continue to be active until the contractual closing. The bids will continue as they were prior the unexpected closing.